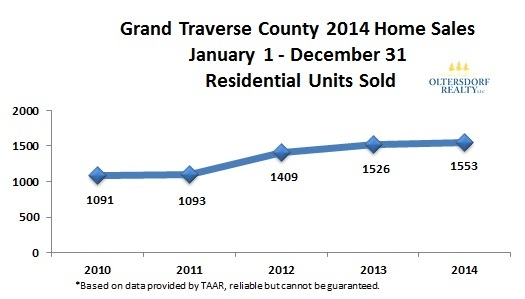 The 2014 year-end (January 1 – December 31) home sales data for Grand Traverse County has been posted in the charts above. The home sales statistics compare real estate housing sold in Grand Traverse County from January 1, 2014 through December 31, 2014 to the same time period in 2013, 2012, 2011, and 2010. This includes the townships of Acme, Blair, East Bay, Fife Lake, Garfield, Grant, Green Lake, Long Lake, Mayfield, Paradise, Peninsula, Union, Whitewater, and the City of Traverse City. 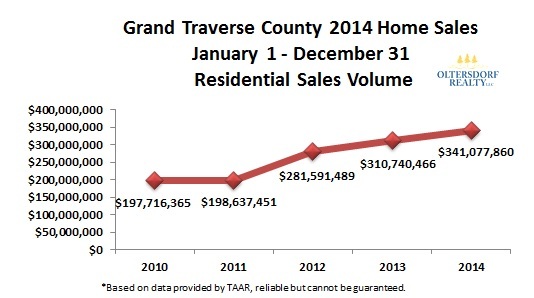 During 2014 Grand Traverse County Home Sales Volume increased +9.75% over 2013's record setting figures. Average sales price is up +7.85% while Median Sales price is up +6.06%. Total number of units sold has increased +1.77%. This report is based upon sales information obtained from the Traverse Area Multiple Listing Service from 2010-2014. Undisclosed sales are not included in the data. This is for basic review purposes only. All attempts for accuracy have been made but cannot be guaranteed.